"Aguila Azteca", the Aztec Eagle, connecting with the Texas Eagle of the Missouri-Pacific, was the train of prestige from the U.S. border at Nuevo Laredo to Mexico Ciudad - and the fastest way from Europe to Mexico. Through sleepers from New York to Mexico were reported by a wealthy lady who traveled that way and enjoyed the perfect service and the wonderful meals - and somewhere in Mexico the train stopped and the poor did come to get some food. The way from the USA was the Missouri-Pacific, in 1879 acquired by railroad tycoon Jay Gould. He added the Missouri-Kansas and Texas Railway (the "Katy"), which reached San Antonio in 1900. Gould established the connection with Laredo on the Mexican border by his International & Great Northern. In 1881 the Texas-Pacific, also controlled by Gould, completed the link from Dallas on the way to El Paso near Ciudad Juarez, the other door to Mexico. 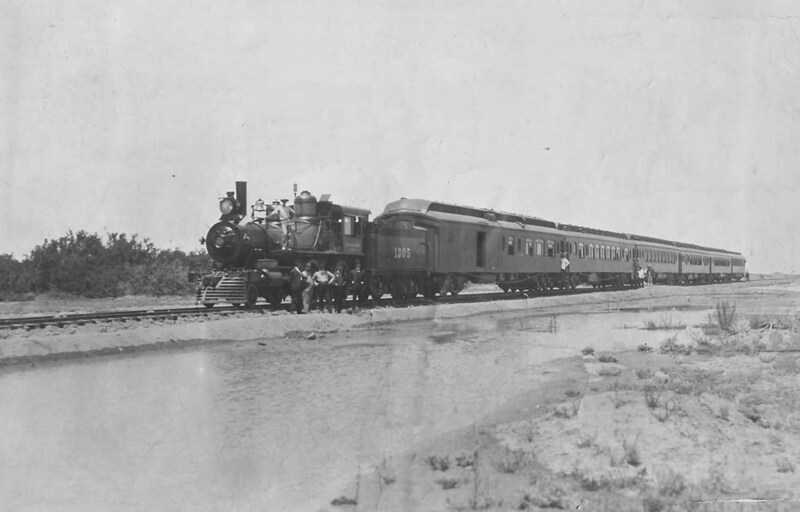 A connection from Dallas to Chicago was the St. Louis-San Francisco (the "Frisco"), temporarily owned by Gould, temporarily by the Santa Fe. Gould's empire fell apart, but the Missouri-Pacific (the "Mopac") survived, absorbed by the Union Pacific in 1982. From 1915 the flagship of the Missouri-Pacific empire was the "Sunshine Special", announced with sleeping-cars from St. Louis and from Memphis to California and via Laredo to Mexico City. The timetable of 1916 however showed it only as a train St. Louis - San Antonio with cars also to El Paso. The crack train of the Frisco and Katy was the Texas Limited St. Louis - San Antonio. In 1929 the tourist agency Raymond & Whitcomb, famous for their "Land Cruise Liner" specials, consisting of Pullman sleepers, diner and observation car with gym and barber shop, offered tours form San Antonio to Mexico City and Guadalajara, but the crisis stopped these trains in 1931. From 1937 a once weekly "City of Mexico" left St. Louis every Sunday evening and arrived at Mexico on Tuesday evening. It was described as the fastest connection for travelers from Europe, arriving by steamer at New York, to Mexico - a "luxury tourist train" exclusively with 1st class Pullman sleepers. It ended in December 1940. The famous connections from the East Coast were the Eagle services with blue/gray "10 and 6" Pullman sleepers of 1950 by the Pennsylvania Railroad, the Missour-Pacific and the Texas-Pacific. The Texas Eagle conveyed a Pullman sleeper St. Louis - Mexico, at San Antonio taken over by the Aztec Eagle, in Mexico called the Aguila Azteca. On the Missouri-Pacific the Eagles were hauled by the nice blue/grey "long nose" Alco diesels. L.H. Westcott had described the border crossing by the Aztec Eagle (Trains & Travel, Oct. 1953): "A Baldwin diesel switcher coupled onto the rear of the train and pushed it onto the bridge across the Rio Grande River. Here a picket gate was opened and a guard carefully watched the cars as they rolled by. The switcher uncoupled and went back to the U.S., and there our cars stood in the middle of the bridge while the Mexican officers examined everyone's luggage. The customs inspection was finished in about 20 minutes, and a National Railways of Mexico (NdeM) 0-6-0 steam switcher from Nuevo Laredo was attached to the front of the train. We were pulled across the rest of the bridge right through the station, and then backed into a stub track. There was a long stop here". 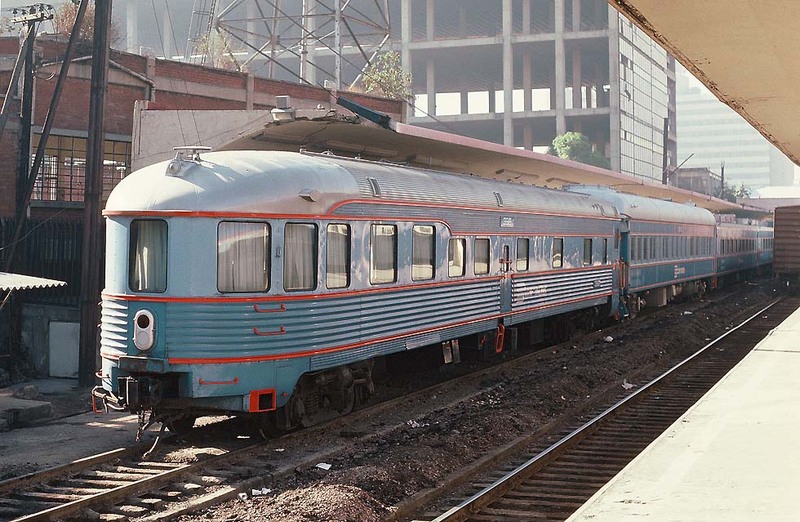 After Amtrak had saved passenger traffic, during the '70s there was an Inter-American with coaches Chicago - Dallas - San Antonio - Laredo, a bus link across the border to Nuevo Laredo and connection by the Aguila Azteca with sleeper, diner and coaches to Mexico City. Then only the Texas Eagle connected Chicago with San Antonio and there is no longer any regular passenger train for Laredo. The connecting line from Nuevo Laredo to Mexico City was built by the Denver & Rio Grande under W.J. Palmer, using 3ft gauge. 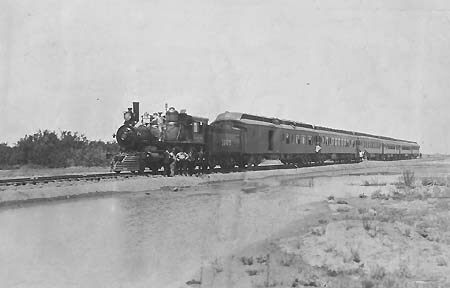 Conversion to standard gauge reached Escobedo in 1903. There it connected with the Mexican Central Railway, the other route from Ciudad Juarez (near El Paso on the Southern Pacific) to Mexico City. It had been completed already in 1884 by the Santa Fe. Standard gauge like almost all mainlines, these railroads formed the Nacionales de Mexico (NdeM) in 1908. In 1911 the revolution started. Dictator Porfirio Diaz, who had enabled to build the rail network, fled via Vera Cruz, in 1913 Pancho Villa conquered Ciudad Juarez and he used armored trains on the line to Mexico. After revolutionary Zapata had killed 400 people by blowing up a train Mexico - Cuernavaca in 1916, ruler Carranza ordered to shoot all people near a railroad! Under those circumstances it's clear that the announced "Sunshine Special" sleeper did not run to Mexico. Only in 1920 under president Obregon the country got some peace. Mexico's prestige train was the Aguila Azteca - the traditional connection with the United States and with the Eagles of the Missouri-Pacific. L.H. Westcott described it in his report, published by Trains & Travel in 1953: "It was almost dark when the train, now called Aguila (eagle in Spanish), pulled out (of Nuevo Laredo) and around a broad curve to the west. 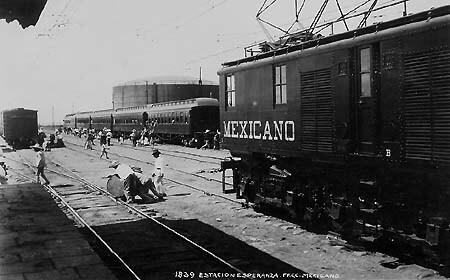 The locomotive was a two-unit EMD FP-7 painted dark green with dusty coral lettering NACIONALES DE MEXICO. Behind (the vans) came two drab second-class coaches packed to the vestibules with Indians - men with long-sleeved white shirts and broad hats and women in long flowing skirts� the first class car was orange with a brown stripe, a fairly new semi-streamlined car. Its interior was clean, comfortable, but not luxurious. Then came the Mopac cars in their blue dress - followed by two dark-green Mexican sleepers. As dusk came, one of the customs officers set up a little office in the lounge end of the dining car and interviewed each international passenger.�After we had our breakfast in the dining car the next morning we found ourselves south of Saltillo in a desert which reminded me of the broad valleys of Nevada�The dining-car steward was an Austrian who spoke many languages and carried into his profession all the dignity of the many pretentious hotels where he had worked � We arrived in Mexico City on time at 8 p.m. and taxied to the hotel. We chose the Hotel Ritz�.". The nice FP7 diesels came to the NdeM in the early '50s, followed by the FP9. And they banned the gigantic Niagaras from the prestigious express trains service." For a few more years the road's most modern steam power continued to dominate the busy central corridor north from Mexico City's Valley of Mexico freight yards to Escobedo and Aguascalientes", wrote Harold Edmonson in "World Steam in Action" about the black NdeM Niagaras. These 32 engines had been built by Alco and Baldwin from 1946. 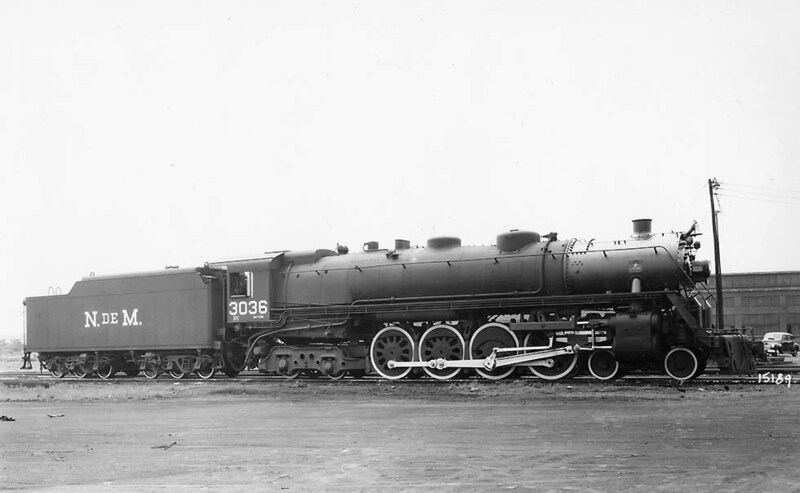 Though they were lighter than several ones used in the United States, they were the heaviest locomotives outside America. In 1952 NdeM ordered elegant train sets form Schindler, Switzerland, consisting of sleepers with en-suite facilities, also Pullman-type sleepers, 1st class de Luxe and 1st ordinary coaches, diner and a round-end observation lounge car. There was the intention of through-running to the USA. In the '80s however Aguila Azteca was a mix of various cars without diner, running Nuevo Laredo - Mexico. There was a better train consisting only of sleepers, diner and observation saloon, El Regiomontano from Monterrey to Mexico. On the other line to the American border, el Fronterizo from Mexico City to Ciudad Juarez was hauled by a pair of dark-green/red GP38-2 diesels. A photo showed it with the usual mail box car, 4 vans and 8 passenger cars. During steam age a Baldwin 0-6-0 hauled a shuttle between Ciudad Juarez and El Paso. On the Guadalajara line, El Tapatio was around 1960 one of the four last all-Pullman trains of North America. The old heavy-weight Pullman sleepers, painted light-turquoise with a red stripe, were replaced by newer cars bought by NdeM second-hand from USA. 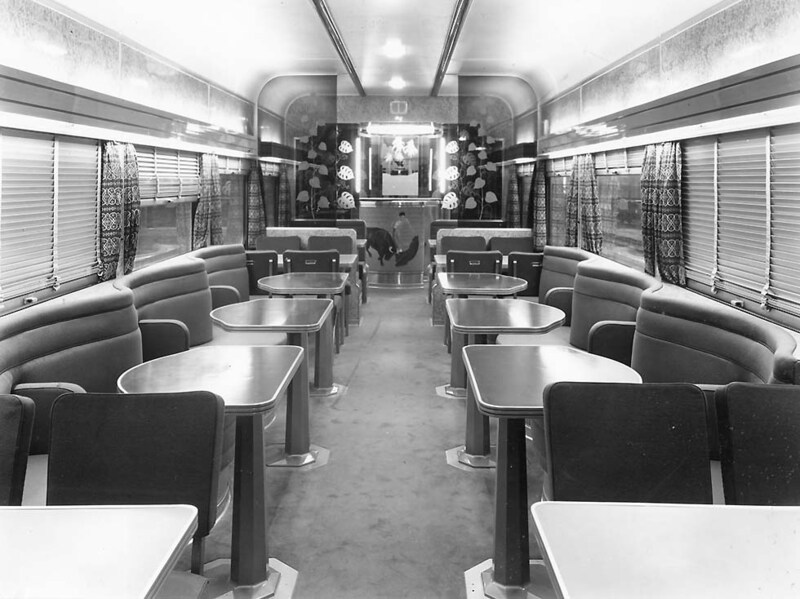 It was a variety of sleeping-car types with drawing-rooms, bedrooms, roomettes, Pullman sections and round-end observation cars. Still in the �80s El Tapatio appeared exclusively with sleepers Nogales - and Mexicali - Mexico as well as sleepers, diner and observation saloon Guadalajara - Mexico. The sleeping-cars from the border stations formed a part of El Costeno, which was shown by a picture with 2 green General Electric and one General Motors, 1 van, 4 coaches and other 5 vans. 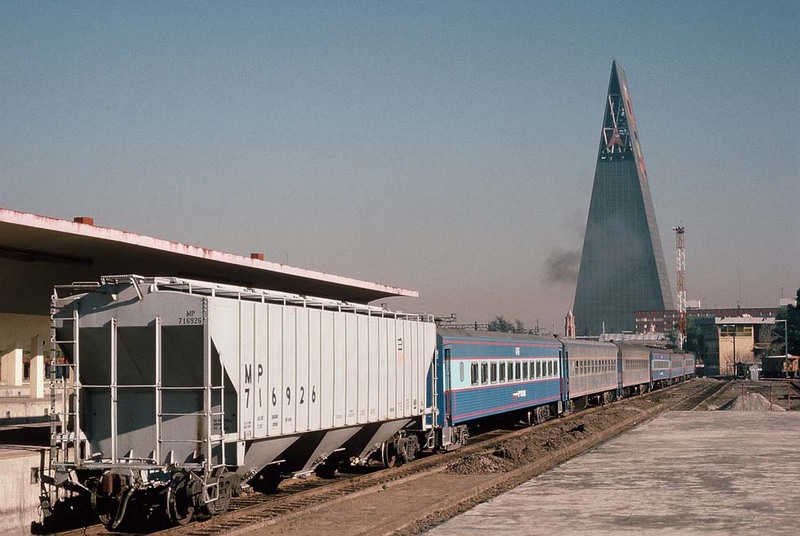 It included cars from El Mexicali, which on the Sonora Baja was hauled by a GP40-2 diesel. Really spectacular is the line from Mexico City to Vera Cruz. Planned already in 1855 as a link between the Caribbean and the Pacific, it was completed by British investors in 1872 (for more information see F.G. Franco: Railroads in Mexico). It must not be confused with the 3ft gauge Interoceanic Railway of 1888, which was intended as a connection Vera Cruz - Acapulco. 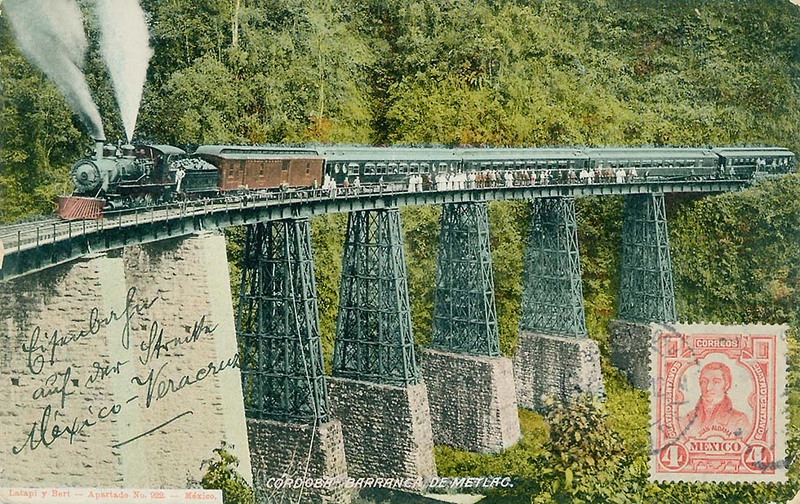 On the British �Mexicano� line, double-ended Fairlie compound engines operated on its steepest 4.7 percent grade section before electrification in the �20s. Once again L.H. Westcott gives an impression: �Our train was headed by a middle-weight 4-6-2� The train was much like other Mexican passenger trains in makeup except for the rear car. 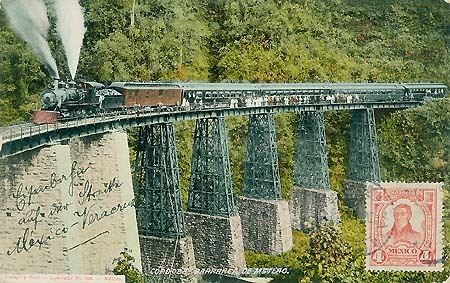 This was a rounded-roof observation car fitted with lounge, widely spaced reclining seats and a small kitchen� The second half of the Mexican line to Vera Cruz is electrified most of the way and the track winds down one of the steepest, sheerest cliffs ever negotiated by a railroad� We reached Vera Cruz, hot and humid, after dark.� A photo of 1961 showed a Vera Cruz - Mexico train, with a BoBoBo type electric engine and two F diesels. In 1970 electrification was cannibalized and a picture showed the express El Meridano with 4 black/red road-switcher diesels, 5 brown box-cars, another diesel and 6 light-blue passenger cars. El Meridano was the train from Mexico to Merida, which had become possible only in 1962 when the NdeM was fully connected with the re-gauged United Railways of Yucatan. From 1969 it was the Unidos del Sureste, using the nice long-nose Alco diesels. Much more important could become a modern replacement of the old line between Coatzacoalcos on the Caribbean and Salina Cruz on the Pacific, a relief for the Panama Canal, for container trains only. In 1993 El Meridano stopped running. The Aguila Azteca consisted in 1995 of 2 simple coaches and 3 box-cars. The express from Ciudad Juarez to Mexico City was not better. And on the former Southern Pacific of Mexico only some migrant workers waited for the late-running Tren del Pacifico, successor of El Costeno, to carry them to Nogales or Mexicali and then for somebody to bring them over the border to Los Angeles. Soon the last passenger trains were closed down and Mexico now was ready to sell its almost bankrupt railroads to US companies - for freight traffic. One line however was to preserve passenger traffic, the Chihuahua al Pacifico - the line of the Copper Canyon, appreciated as the most spectacular railroad of the world. Once the Texas, Topolobampo & Pacific Railroads, then the Kansas City, Mexico & Orient Railway wanted to build the shortest link from New York to the Pacific Ocean through this wild mountain range, the Sierra Madre. Really a mad idea, to build a railroad there! Only in 1961 the government completed it. There had been an Expreso de Lujo, then the Vista Tren, and dark-green/red General Motors hauled dark-green streamlined cars from German LHB production. Also specials did come. One of them transported �Airstream� caravans to the coast, for there is no road. Vista-domes from the California Zephyr were acquired for the Southern Orient Express, with sparkling stainless/maroon cars a sensation on the Copper Canyon line. Later they were sold. Last Web information about the Southern Orient Express had said that in 2003 the reservation office was closed and �service may be resumed in 2004�. 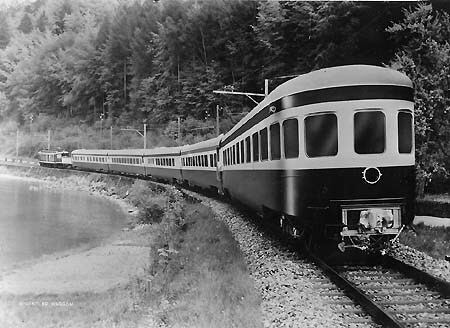 RailsNW advertised a dark-red/cream colored express with dining-car, bar, vista-dome and round-end observation car. The classic American Orient Express and other beautiful specials appeared there. And the Chepe with a red GM diesel of Ferromex and the refurbished Japan-built cars, including a diner, now being painted yellow/black and red/black, continued regular service on the most exciting railway of the world. 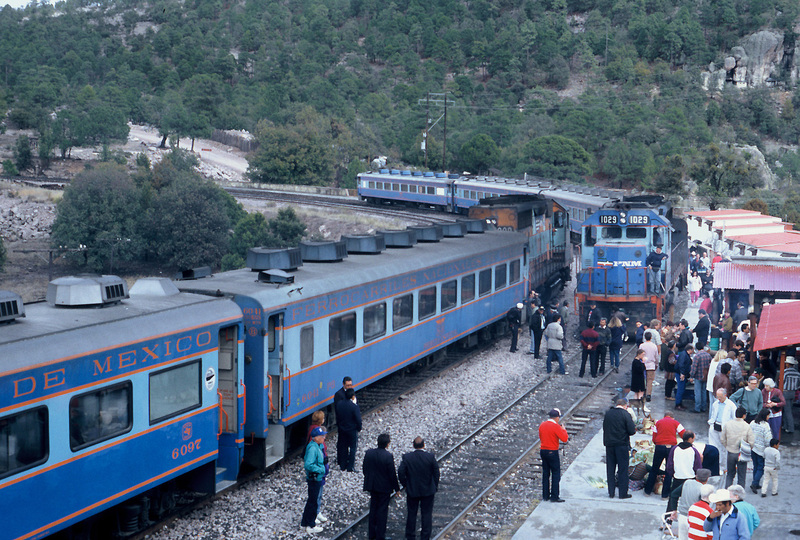 The Copper Canyon remained not the only line with tourist trains. An Expreso de la Independencia started trips from Queretaro in the north of Mexico City and in Yucatan the Expreso Maya with red/white standard cars offered excursions from Merida. Once also a Caribbean Orient Express had been announced. While the old regular passenger trains in Latin America disappeared, the new railway age became intended to start in Mexico: In 2005 plans for a high-speed line Mexico C. - Guadalajara were published. The distance of c.600 km should be covered in roughly two hours. 1872: Vera Cruz - Xalta - Mexico completed by Imperial Mexican Railway. (later the Mexicano). 1882: Sonora Railway Nogales -Guaymas completed by Santa Fe, then Southern Pacific. 1884: Mexican Central Railway Ciudad Juarez - Mexico completed by Santa Fe, then also Guadalajara and Tampico. 1888: Mexican National Railroad Nuevo Laredo - Mexico City (by D&RG), 3ft-gauge, 1903 standard gauge, bought by government. 1908: Ferrocarriles Nacionales de Mexico (NdeM, National Railways), comprising the former National, Mexican Central, Interoceanic (3ft gauge) as well as Veracruz & Isthmus Railroad and Pan-American Railroad, connecting Vera Cruz with Ciudad Hidalgo at the border of Guatemala. 1927: Sud-Pacifico de Mexico (Southern Pacific) extended to Guadalajara, connecting with the NdeM. 1948: Mexicali - Benjamin Hill completed by Ferrocarril Sonora Baja-California (SBC), connecting with Sud-Pacifico. 1997: Privatization started, regular passenger trains disappeared, except Chihuahua - Los Mochis by FMF. 1 Pullman sleeper (10 sections, 1 drawing, 2 comp.) St. Louis - Mexico. Cars and diesels by Mopac, blue/gray with a yellow stripe, Baldwin switcher by Mopac at Laredo, 0-6-0 steam switcher by NdeM at Nuevo Laredo. Colors: FP 7 dark-green, mail black, NdeM 1st class orange with a brown stripe. 1 2nd class Mexico - Nuevo Laredo? 1 1st class Mexico - San Luis Potos�?